One of my faults as a photographer is my workflow management. I snap away, loving the moment, upload a host of shots, pick the best one of the day and leave the rest to languish, neglected on my hard drive. But sometimes I happen across a rejected shot and find I like it. Perhaps such happy accidents make the chaos worthwhile. Anyway, this afternoon I happened across this forgotten shot from the Spring, and I was glad. Do you live, like me, in a state of photographic disorder, or are your files neatly honed, indexed, and double backed up? 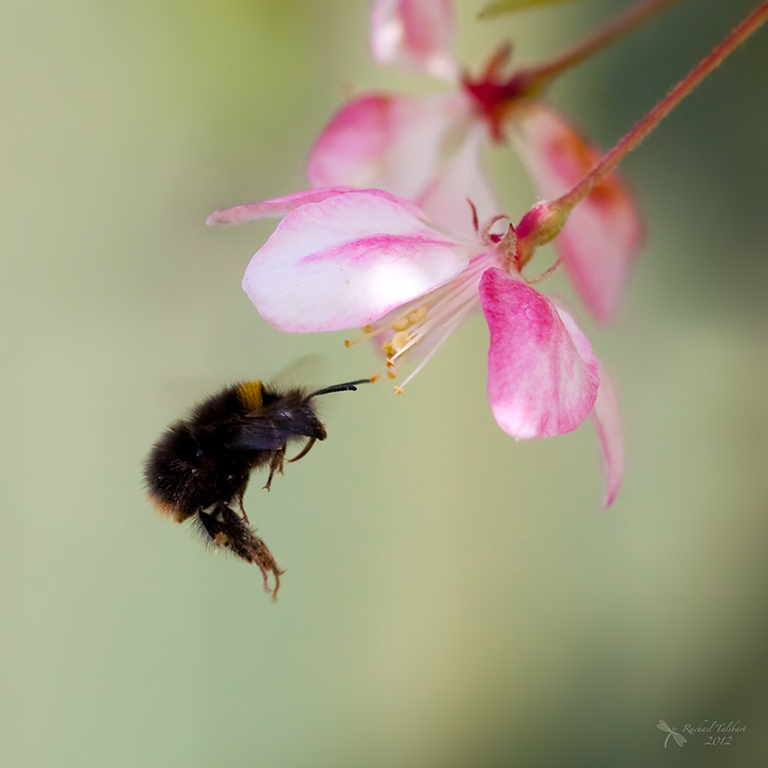 This entry was posted in garden, nature, photography and tagged bee, blossom, flight, garden, insect, macro, photograph, photography, serendipity, spring, workflow by Rachael. Bookmark the permalink. A lovely shot almost forgotten. Don’t hate me, but my photos are organized by event and chronologically, and are on 2 hard drives at all times. I’ve always been way too organized. Once I organized myself I found it was easier to stay that way, and plus you can find things in a snap. I’m with you Rachael… though I do have MOST of my shots on 2 hard drives it’s just finding them !! Lovely capture. My photos are categorized by theme. Thanks! Discovering the forgotten gems is so much fun. I love your bumble bee in flight, he looks as if he is backing out and hasn’t had the time to get his tongue tucked away yet. I agonise about keeping too many shots that I will never look at again, I sort them into categories and then years. At least you sort them. Mine are simply by date. I use Flickr to find them again.